GRANITE BATHROOM COUNTERTOPS - GET YOURS! Natural stone gracing your kitchen adds style and flair to your home, as well as enhancing its value. Austin Stone Works offers a large variety of kitchen countertops and can help you create a custom look that accents your home beautifully. Countertops are available with a wide variety of shapes, styles, colors and materials including marble bathroom countertops as well as granite and other natural stone. We'll be happy to offer our expertise to help you decide what stone and colors would be most suitable for the unique quality of your home and lifestyle. Natural stone tile is an excellent way to bring long-lasting luxury to your home. 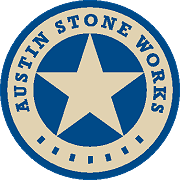 Austin Stone Works offers a wide variety of stone, from the most popular colors to the very exotic. Not sure what you want? Look at our project photos-they may help give you some ideas. Great customer service and beautiful countertops. I am very pleased. I am thrilled with the countertops I got from Austin Stone Works. They are beautiful. Everything was done as promised. The customer service was fantastic. The measurer and installers were very professional and courteous. Kim (who works in the office) provided the best customer service I could have received. When my sink came in with a hairline crack (it was a sink I ordered elsewhere), she did all the legwork and got a replacement sink directly from the manufacturer in a short amount of time without me having to return the sink or find the replacement. Even after the job was complete, she helped me with backsplash options. She is awesome! I highly recommend Austin Stone Works and will use them every time I need stonework done in the future. I could not have had a better experience. I love my remodeled 1976 kitchen! Austin Stone Works did an excellent job helping me choose my granite and installing it. I took a floor sample, woodwork picture and rock pictures. Kim Hauger was easy to work with and so knowledgeable. She also helped me choose the back splash tiles and grout color. They came when they said they would. The installer answered all my husbands questions about granite and mine about the care of it. The quality of their stainless steel sink is better than others we had seen. All my appliances fit and everything coordinates. The Astoria Gold is beautiful! I would highly recommend Austin Stone Works. We searched all around town and Austin Stone Works gave us the best price along with the options we needed. Measuring was perfect. The installation was very quick. They were very careful to clean up any mess. I noticed one minor flaw after they left. They quickly and professionally returned and corrected. They also took time to show me how to care for the stone and what chemicals to use and not to use. Very happy. Mike at Austin Stone Works has performed numerous jobs at our current home in Westlake. Each time, both the quality and design have been second to none. The staff are professional and we love their work. We tried multiple suppliers before landing on Austin Stone Works. I have used Austin Stone Works in my personal home as well as on large commercial projects for my company! Whether they are doing a small job or a large one, the quality, customer service, and price are always amazing! Kim was incredible. She offered multiple options and provided great decorator feedback. She acknowledged our budget and offered multiple options. Their team was courteous and professional on site. The process was exceptional and we will use them again. As a kitchen remodeling contractor I sent numerous clients to ASW. The pricing is competitive for the quality of work performed and my clients have been well pleased with the final results. My strongest recommendation is that the people there, MIke, Lou, Kim, and their installers all care about getting everything right. Any issues have been resolved with a professional attitude and great follow up. Great company to work with. Honest straight forward company with some of the friendliest folks in the business!